The Lobster Feed and Charity Auction: What Do 600 People Know That You Don’t? If you haven’t attended the Lobster Feed and Charity Auction, you’re missing out so order your tickets online for this year’s event held this Saturday, June 15, beginning at 5:00 p.m. at the Lakewood Center at 368 S. State Street. Tickets are $125 for regular seating ($95 tax deductible) and $150 for patrons ($120 tax deductible). Click on the link in the article. Success bears repeating. 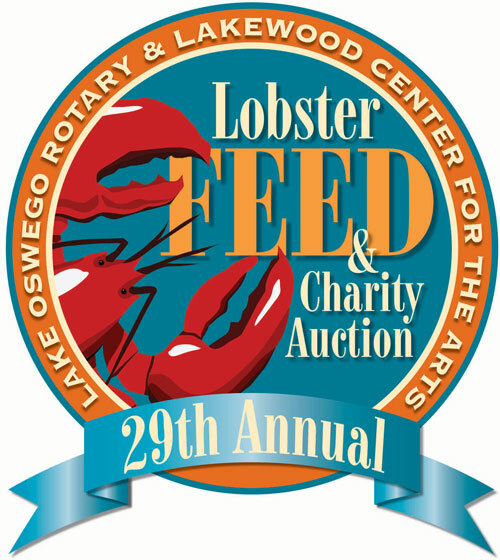 That’s why the Lobster Feed and Charity Auction hosted by the Lake Oswego Rotary Club and Lakewood Center for the Arts is in its 29th year, kicking off at 5:00 p.m. this Saturday, June 15 under the big tent at the Lakewood Center, 365 S. State Street. Imagine a giant clambake with a few hundred of your favorite people, all dripping butter and drinking wine and cracking-slurping-sucking lobsters while laughing together to raise money for wonderful good causes. That’s the Lobster Feed! – Linda Brown, attending since 1987. The Lake Oswego Rotary Lobster Feed is the biggest, best party in Lake Oswego each summer. I love it because it’s different (lobster and clam bakes are no big deal in New England but this is a one-of-a-kind event in Oregon), it raises money for great causes, looking for bargains in the silent and oral auctions is fun, and it’s a great place to see friends and be seen. – Peter Glazer, attending his estimated 27th Rotary auction. The Lobster Feed and Charity Auction is a great event because it epitomizes the qualities that Lake Oswego Rotary stands for: a wonderful sense of spirit and camaraderie, blended with service to our community.- Don Irving, attending his seventh Rotary auction. The Annual Lobster Feed and Auction is truly amazing! At the Rotary club level I see generosity and teamwork. At the community level I see support. The non-profit organizations that offer services to our community are often stretched thin as they meet their client needs, recruit volunteers, and raise financial support. The proceeds from the auction are given to these life-encouraging non profits to assist them financially. Personally, I see my eyes opened to areas of service in the Lake Oswego community that I didn’t know existed. When I team up my efforts with others, the effects are multiplied throughout the community. –Terri Childress, attending her fourth Rotary auction. The great thing about the Lobster Feed is that it’s always on the same day–the third Saturday in June–and you get to see all of your friends in one place, at an event that’s lots of fun! – Peter Jurney, attending his 27th Rotary auction. Order your tickets online and discover what you’ve been missing. Subscribe to this blog to make sure you don’t miss out on what’s great about living in Lake Oswego every week. Just click on the “Sign me up” button in the top right hand column. This entry was posted in Things to Do in Lake Oswego and tagged Lobster Feed and Charity Auction. Bookmark the permalink. 1 Response to The Lobster Feed and Charity Auction: What Do 600 People Know That You Don’t?